Preschool children are placed in classes according to their maturity and readiness skills, not their chronological age. Preschool children enjoy all the traditional activities including “dress-up”, playing in the playhouse, music, and art. The program is a blend of self-selection play activities and a carefully planned child development program that enhances the intellectual, social, emotional, and physical development of the child. Children are taught colors, shapes, number and letter recognition, letter sounds, and math concepts, like time, money and addition. The children have many activities that aid in developing their fine and gross motor skills. It is unusual for children to learn to read in preschool. The students at El Rancho are introduced to phonics early, and by the time they have completed the pre-kindergarten, they are sounding out words, and have read their first books. Our enrollment process includes a 2-hour visit for the child and parent. We cannot enroll children whose behavior on their visit includes swearing, running away, kicking, hitting, or disrespectful or hurtful behavior to others. El Rancho School is a place where parents are comforted to know that their child is playing with children who are not mean or hurtful to others. The most important factor in determining whether your child has a great day at preschool is their teacher. El Rancho teachers are selected, not just for their education, but for the personal qualities that they bring to their classrooms. A preschool teacher must have a kind and gentle ‘heart’. For more information on the personal qualities, education and experience of teachers, click here. Comparison of Programs: There are several ways in which preschool programs are run. The first is the “child directed” program, in which the teacher puts out materials and the children select what they wish to play with. The second is called “thematic” in which there is a weekly theme. In this approach, there is typically a “circle time” where the teacher introduces the theme and activities flow out of the topic. An example would be “farm animals”. Kids learn about what animals live on farms, what they eat, what their products are, how they are used, etc. Thematic programs present social studies content. The El Rancho program is a blend of self-selection play activities and a carefully planned child development program. The planned program was developed to enhance the intellectual, social, emotional and physical development of the children. Depending on the age and maturity of the group, it lasts for one to two hours. Each of the activities are short, but by the pre-kindergarten class they have become somewhat longer. The activities are both active and sitting, indoors and out. There is a mid-morning snack period between activities as well. 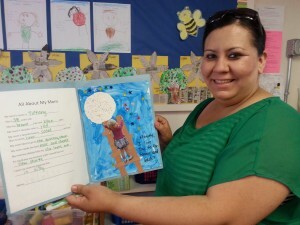 Kindergarten Readiness: Every parent wants their child to be a successful student. 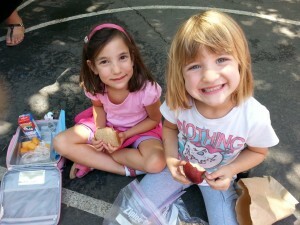 How well are El Rancho preschoolers prepared for kindergarten success? Almost all of the El Rancho kindergartners moved up from the pre-kindergarten class. The wonderful phonics program in the preschool gets them ready to start reading at the beginning of kindergarten. The mathematics foundations in counting, patterning, and sequencing are developed in the preschool as well. El Rancho preschoolers enjoy a fun-filled day and parents have the peace of mind in knowing their child is happy, safe, and learning something new and wonderful everyday! El Rancho accepts children who are at least two-years-old. We will work with you on potty-training your child. If you are interested in seeing the program, please stop by the school for a tour and room visit. By all means, bring your child if you would like. The school opens at 6:30 AM and class time starts 9:00 AM.